Two of the four BT phone boxes along Kensington High Street are no “boxes” at all, but the ST6 panels, launched in 2007 as a joint venture between BT and JCDecaux, with a phone on one side and an advertisement panel on the other – much higher and wider than traditional phone boxes. On Saturday 27 January, the Local Government Association (LGA), which represents 370 councils in England and Wales, urged the government to scrap the permitted development right which enables companies to install telephone boxes without planning permission. Last year, BT launched a totally new “phone box” system, the 2.9 metre high InLink, with advertisements on both sides of the slab, a free phone on one of the short sides, and a free high-speed wi-fi hotspot transmitting from the top. The plan is to replace all traditional BT phone boxes in London with these. Picture from Google Street View, (c) Google. This statement is very welcome. In an era where almost everyone has a mobile phone and existing telephone boxes are hardly ever used, local councils have suddenly been inundated with planning notifications from companies planning to erect more telephone boxes. Kensington & Chelsea has seen applications to install phone boxes under permitted development rules increase from 13 in 2015 to 97 in 2017, and Westminster has seen an increase from 13 to 180 during the same period. The reason for this upsurge is a legal loophole: while advertisement screens (from large hoardings to advertisement panels on bus stops) require permission and can be refused for their impact on amenity or road safety, a law from 1984 states that installation of telephone boxes is permitted development which only requires a notification to the council if it’s not in a conservation area. So, just attach a telephone to the back of the advertisement screen and call it a phone box instead. The council may only refuse the installation of a phone box if it would be an obstruction or because of its design but the Planning Inspectorate will almost always grant an appeal against any such refusal if there are already other such installations in the area. In December 2015, Clear Channel UK, which operates more than 40,000 advertising sites in the UK and is owned by bankruptcy threatened US company iHeartMedia, bought NWP Street Ltd (operator of the phone box network New World Payphones) from Arqiva (which in turn had bought the business by acquiring Spectrum Interactive in 2012). A month later, Clear Channel announced to their advertising customers that they would replace the existing New World/Arqiva phone boxes with new “kiosks” fitted with their Adshel digital screens, which “will be situated in high footfall areas and will be positioned for optimum visibility from both pedestrian and vehicular audiences.” The new NWP units are being built by Lord Sugar’s Amscreen and resemble the BT/JCDecaux ST6 panels. In October 2016, BT announced that it had switched advertisement partner, from JCDecaux to Primesight. In collaboration with New York-based Intersection the two companies have began installing UK versions of Intersection’s “Link” units (called InLinks in the UK), which since 2016 are popping up all over New York in a joint venture with New York City government. 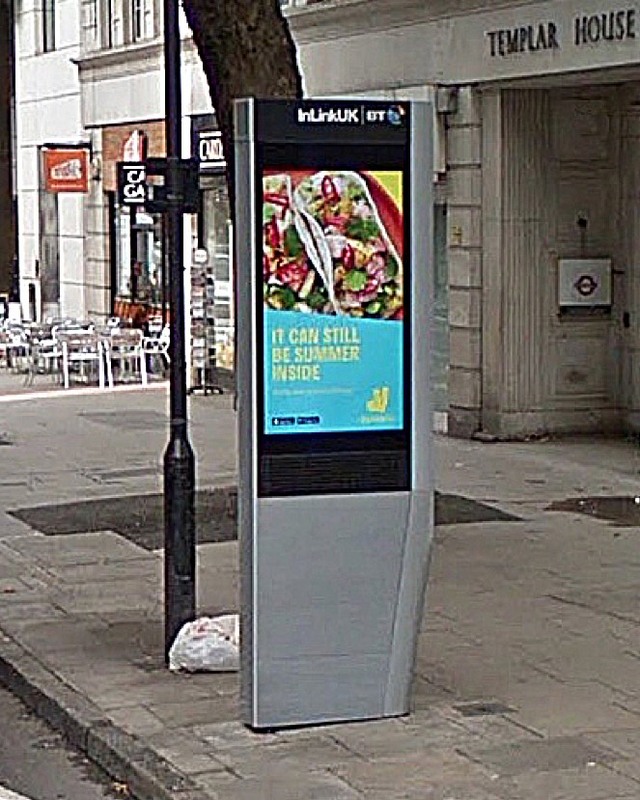 An InLink is even less phone box and more advertisement panel than the ST6 panels that BT launched together with JCDecaux in 2007. The InLinks are three metre high panel towers, with advertisements on both sides, a phone on one of the short sides, and a high-speed wi-fi transmitter at the top. The use of the phone and the wi-fi is free, because the companies make so much from the advertisement. It’s apparently so lucrative that BT is willing to let the the free high-speed wi-fi cannibalise the non-free BT wi-fi hotspot network. The first InLink units were installed in Camden in June last year, and by now close to a hundred of the 750 planned for London are in place, however none in RBKC – yet. Along the 550 metres of Kensington High Street between Derry Street and Earls Court Road there are today nine phone boxes, whereof five derelict NWP boxes and four BT boxes. If these nine boxes were evenly spread along the street, it would mean one phone box every 61 metres – in a time when hardly anyone uses them. The nine old and rather derelict NWP phone boxes along Kensington High Street will be replaced by the new NWP/Clear Channel “kiosks” (which look very similar to the BT/JCDecaux ST6 advertisement panels) if Clear Channel gets its way. Half of the households still in hotels What will happen to Europe’s largest roof garden?